You will find the formulae to be remembered in connection with Doppler effect and some useful multiple choice questions (with solution) on Doppler effect at this location on this site. [If you want all questions on Doppler effect on this site, you may click on the label ‘Doppler effect’ below this post]. n’ = n(v+w–vL)/(v+w–vS) where ‘n’ is the real frequency of sound, ‘v’ is the velocity of sound, ‘w’ is the velocity of wind, ‘vL’ is the velocity of listener and ‘vS’ is the velocity of the source of sound. Note that in the above expression all velocities are in the same direction and the source is behind the listener and is therefore approaching the listener. [The apparent frequency is therefore greater than the real frequency]. n1 = n(v–vL)/v where ‘n’ is the real frequency of the whistle and ‘v’ is the velocity of sound. Therefore, n/n1 = v/(v–vL) = v/(v–v0). Since n/n1 = 1.25,we have v/(v–v0) =1.25 so that 1– (v0/v) = 0.8 from which v0 = 0.2v. A glass jar has the plane inner surface PQ of its bottom silvered and contains water (of refractive index n = 4/3) column of height t = 6 cm. 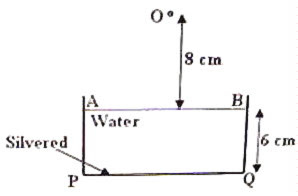 A small light emitting diode (LED) is arranged at O at a height d = 8 cm from the water surface AB (Fig.). The silvered bottom of the jar acts as a plane mirror. At what distance from the free surface (AB) of water will this plane mirror form the image of the light emitting diode? When you look into the plane mirror (silvered surface) PQ from the position O of the LED, the plane mirror will appear to be located at P1Q1 (fig.) at a distance t/n from the free surface of water (because of normal refraction at the water surface). The distance of the LED from this refracted image P1Q1 of the plane mirror is therefore equal to (d + t/n) as shown in the adjoining figure. 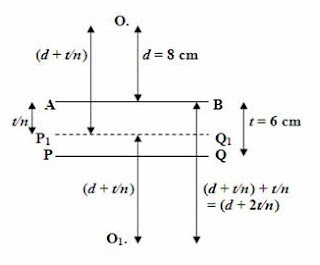 The image of the LED must be formed at O1 which is at the same distance (d + t/n) from the effective plane mirror P1Q1. As is clear from the adjoining figure, the distance of the image O1 from the free surface (AB) of water is (d + t/n) + t/n which is equal to (d + 2t/n) = 8 + 2×6/(4/3) = 17 cm. 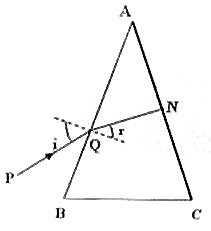 The angle A of the prism (as mentioned in the question) is given by n = 1/sin A where n = 2. [Remember n = 1/sin C where n is the refractive index and C is the critical angle]. Since the ray retraces its path after reflection at the silvered face, it is incident normally at the silvered face (at the point N in the figure). With reference to the figure, angle QNA in the triangle QNA is 90º. Since the angle A is 30º it follows that angle AQN = 60º so that the angle of refraction (r) at Q is 30º. n = sin i/sin r from which sin i = n sin r = √2 sin 30º. This gives sin i =1/√2 so that i = 45º. You may search for ‘optics’ using the ‘search blog’ facility at the top left of this page to find all related posts on this site. A useful post on the equations to be remembered in Geometric Optics can be found here. Let us discuss a few multiple choice questions on work and energy. (1) A small sphere of mass 20 g is projected vertically up with a velocity of 10 ms–1. If air resistance is negligible, what is the total work done by gravity during the upward trip of the sphere? When the sphere rises up its kinetic energy goes on decreasing because of the work done by the gravitational force against the motion of the sphere. (The gravitational potential energy of the sphere goes on increasing by an equal amount). The work done by gravity is evidently negative. When the sphere reaches the maximum height the entire kinetic energy gets converted into gravitational potential energy. The total work done by gravity during the the upward trip of the sphere is numerically equal to the initial kinetic energy (½ mv2) of the sphere but its sign is negative. Therefore, the answer is – ½ mv2 = – ½ ×0.020×102 = –1 J. This question has appeared in various entrance tests with slight differences in the wording and in the options. Last year it appeared in the All India Engineering Entrance Examination. We may take the mass of the athlete to be 70 kg to 80 kg. Let us use 80 kg. 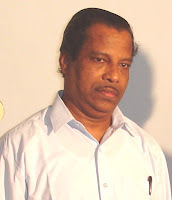 His kinetic energy will be ½ mv2 = ½ ×80×102 = 4000 J so that the correct option is (c). Questions (3) and (4) appeared in Kerala Engineering Entrance Examination 2008 question paper. The concept of impulse will be very useful here. The impulse received by A and B in the times tA and tB are respectively F tA and F tB where F is the force acting on them (4 kg wt. here). But impulse is the change in momentum so that the momenta acquired by A and B are F tA and F tB. Therefore, tA/ tB = √( mA/ mB) = √(20/5) = 2. F = (4i + j – 3k) + (3i + j – k) = 7i + 2j – 4k. W = F.s = (7i + 2j – 4k) . (4i + 2j – 2k) = 28 + 4 + 8 = 40. You will find similar useful multiple choice questions (with solution) at AP Physics Resources. 25.05.2009 Monday 10.00 A.M. to 12.30 P.M. Paper-I : Physics & Chemistry. 26.05.2009 Tuesday 10.00 A.M. to 12.30 P.M. Paper-II: Mathematics. 27.05.2009 Wednesday 10.00 A.M. to 12.30 P.M. Paper-I : Chemistry & Physics. 28.05.2009 Thursday 10.00 A.M. to 12.30 P.M. Paper-II: Biology.